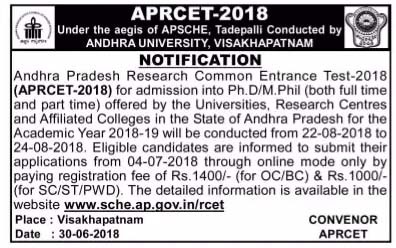 Andhra Pradesh Research Common Entrance Test-2018 (APRCET-2018) for admissions into Ph.D/M.Phil (both full time and part time) offered by the Universities, Research Centers and affiliated Colleges in the State of Andhra Pradesh for the Academic Year 2018-19 will be conducted from 22-08-2018 to 24-08-2018. Eligible candidates are informed to submit their applications from 04-07-2018 through online mode only by paying registration fee of Rs.1400/- (for OC/BC) and Rs.1000 (SC/ST/PWD). Application Fee: Rs.1400/- (for OC/BC) and Rs.1000 (SC/ST/PWD).